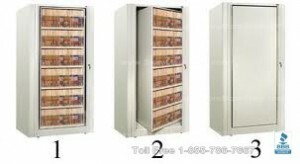 The Spinning Rotary Cabinets are two-sided double deep cabinets that provide fast and easy access to stored materials. The cabinet delivers up to 400% more files in the same floor space than traditional drawer file cabinets. In addition, they can be placed back to back in the middle of a room and are completely freestanding. 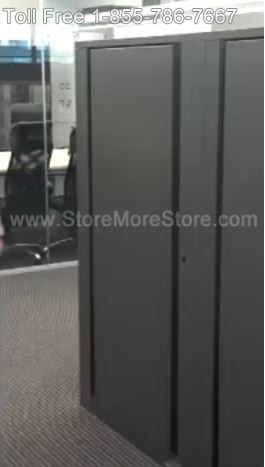 Spinning Rotary Cabinets can be used in an office or an industrial environment. They come fully assembled in letter or legal size with the StoreMoreStore satisfaction guarantee. With one centralized storage unit, you can be sure to easily find what you’re looking for. A three high unit can serve as a convenient work surface with storage underneath for common work areas, or multiple units can be joined together to double as storage and a room divider, which makes the cabinets perfect for virtually any application. Also, Spinning Rotary Cabinets come with a lock to prevent unauthorized access of stored files and other materials. Spinning Rotary Cabinets are true multimedia storage cabinets designed to meet your current needs and flexible enough to meet your future requirements. 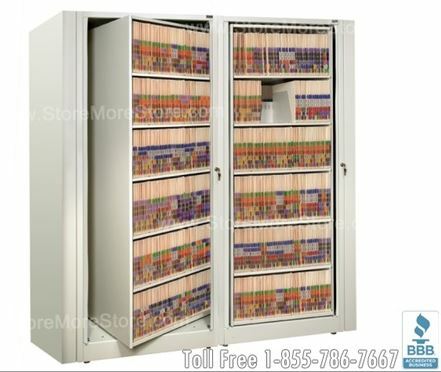 Shop online now at StoreMoreStore to decide which Spinning Rotary Cabinets is right for you. And if you need any help or can’t find what you are looking for, please give us a call at 1-855-786-7667.